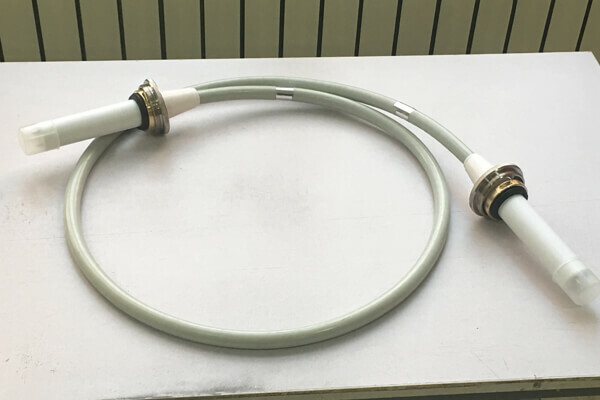 The 2m 90kvdc high voltage cable is used to connect the X-ray machine. X-ray machine mainly by the X-ray tube and x optical source 2m 90 KVDC high voltage cable,and high voltage connector etc, the X-ray tube and the anode and cathode filament target and vacuum glass tubes, x optical source and can be divided into two parts, high voltage power supplies and filament, the filament for filament heating, 2m 90KVDC high voltage cable, high voltage by 2m 90KVDC high voltage cable output respectively on both ends of anode and cathode filament target, A high voltage electric field is provided to accelerate the active electrons on the filament towards the anode target, forming a high speed electron flow. After bombarding the anode surface, 99% of the energy is converted to heat and 1% is due to the generation of x-rays. X-ray machines are widely used in medical and health care, social life, science, and various fields of industry. For example, X-ray machines can be used in hospitals to assist doctors in diagnosing diseases, non-destructive testing in industry, and safety inspection in railway stations, important units and airports. There is a problem in the high voltage circuit. Based on the fault. Generally, 2m 90kvdc high voltage cable is first checked, followed by X-ray tube and high voltage generator. The high-voltage cables at both ends of the cathode and anode were taken out from the high-voltage generator and the bulb respectively to observe whether there were discharge traces on the surface. Newheek 2m 90kvdc high voltage cable is divided into many types. And we can provide quality testing service.